LAS VEGAS – October 29, 2015 – Gateway Classic Mustang, will unveil a wild 1971 Mustang Mach 1 restomod at the SEMA Show on Nov. 4 in Las Vegas at booth #22791. Truly unique in design, this 71’ Mach 1 takes the best parts from 1971 and 2015, to create a one-of-a-kind muscle car that demonstrates the company’s capabilities. Starting with a 1971 Mustang Mach 1, Gateway Classic Mustang took arguably one of the most visually recognizable cars in American history and completely revamped it. Staying true to its vintage roots, the ’71 Mach 1’s visual cues were enhanced. Performance wise, this muscle machine is in a league of its own and includes an upgraded Gateway Performance Suspension package, a huge boost in power via a Ford Performance 5.0L Coyote Engine and Tremec Magnum T56 6-speed transmission. Weight was reduced courtesy of a Carbon Fiber QA1 driveshaft and other key components. In addition to the power and performance, subtle touches that help the Mach 1 stand out, include an electric blue paint scheme with black vinyl graphics, as well as a new interior featuring Classic Instruments, Recaro seats and an upgraded Kicker sound system. A Magnaflow exhaust system was outfitted on this updated classic to help the pony car hit all the right notes as it’s cruising down the road. Gateway Classic Mustang is a nationally acclaimed restomod and pro touring Mustang builder, as well as a manufacture of key aftermarket performance parts. Suspension manufacturing, full restoration, paint, and installation services are some of the key ingredients to the success of GCM. 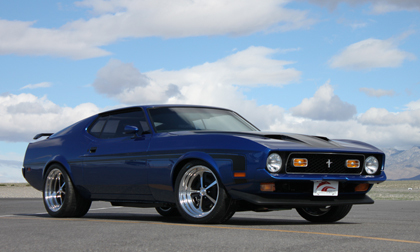 Gateway Performance products redefine classic cars and turn modern Mustangs into track stars.